The Trash-Ease is the most convenient and practical way to have a trash bag handy indoors and outdoors. Hang a Trash-Ease on bleachers, picnic tables, kitchen counters, craft tables, decks, campers; you can use it anywhere you need to collect trash! Trash-Ease keeps trash off the ground and won't tip over or blow away. This makes it a camper's best friend! Hang a Trash-Ease indoors from kitchen counter overhangs, tables, work benches, and crafting areas for easy clean up and eliminate the need for bulky, dirty garbage cans all over the place! 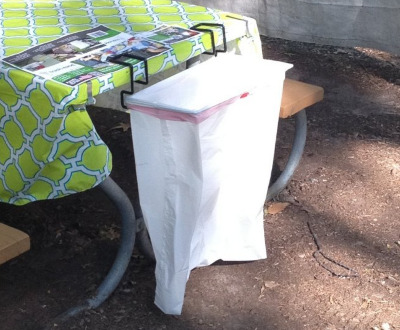 Trash-Ease uses standard 13 gallon draw-string trash bags. Trash-Ease is powder coated to prevent rust and the ends are rubber coated to protect surfaces from scratching. Trash-Ease slim, one piece construction allows it to be stored easily away or hung without fear of losing pieces. No tools needed, ever! Trash-Ease is 100% made in the USA. 13 Gallon size is portable, lightweight, and convenient way to collect trash. 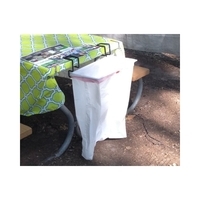 Use indoors and outdoors; wherever and whenever you need to collect trash in a clean, efficient, and "hands-free" manner, use a Trash-Ease trash bag holder! Use Trash-Ease OUTDOORS on picnic tables, bleachers, and benches during ball games, sporting events, picnics and while camping! 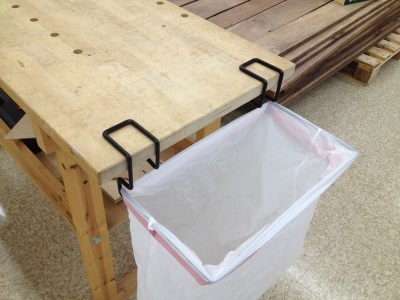 Use a Trash-Ease INDOORS on counter overhangs, tables, and workbenches for scrap-booking, crafting, sewing, gift wrapping, and while working on school projects!